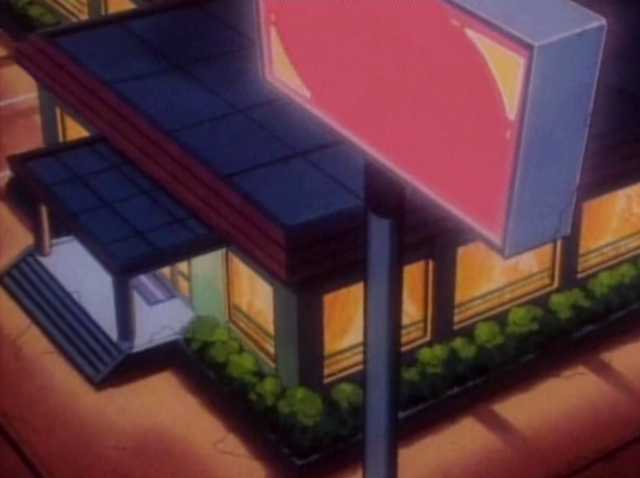 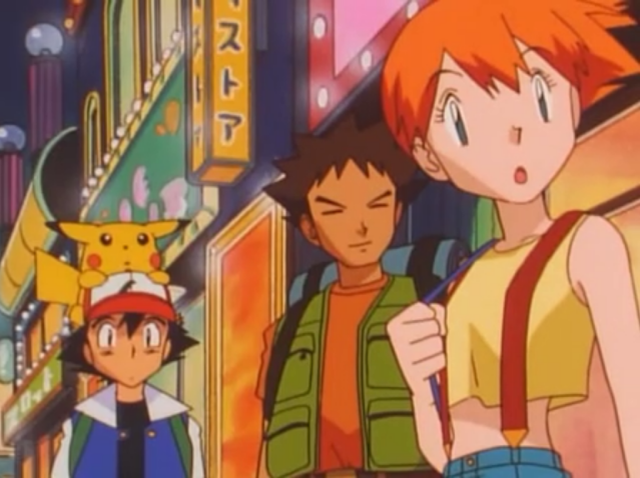 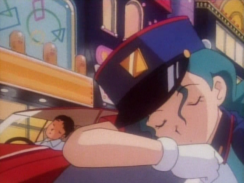 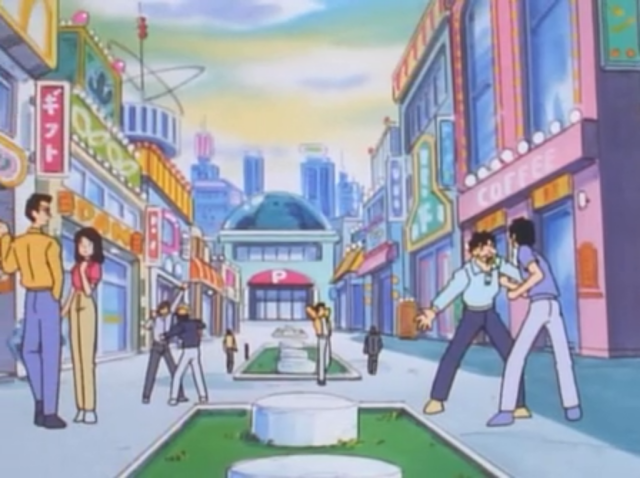 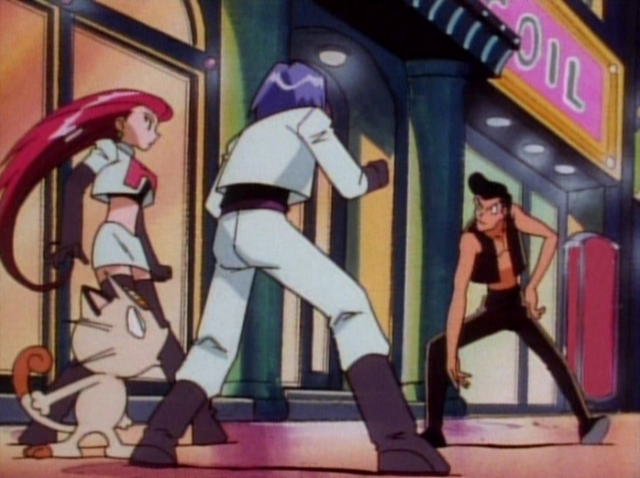 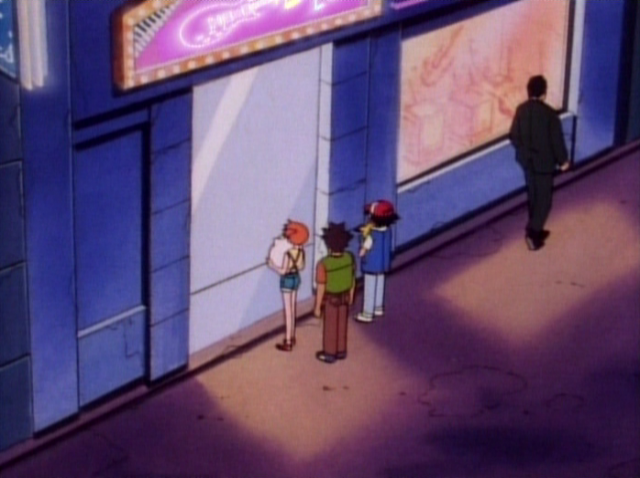 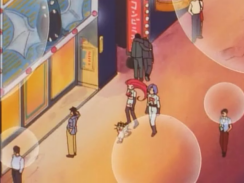 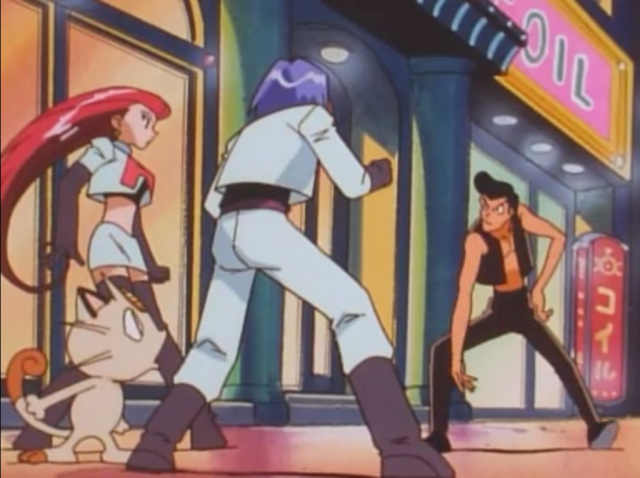 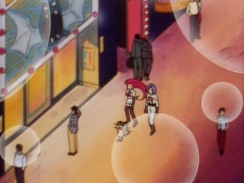 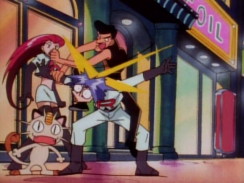 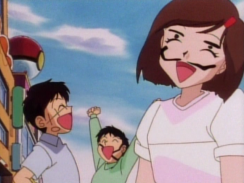 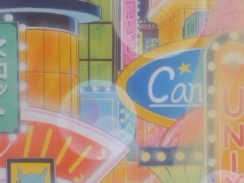 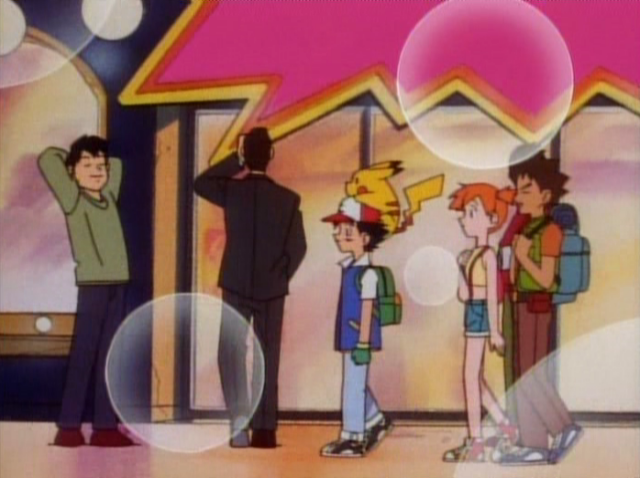 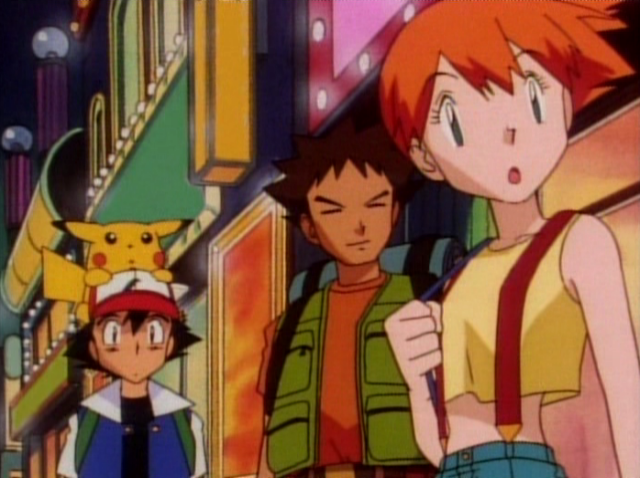 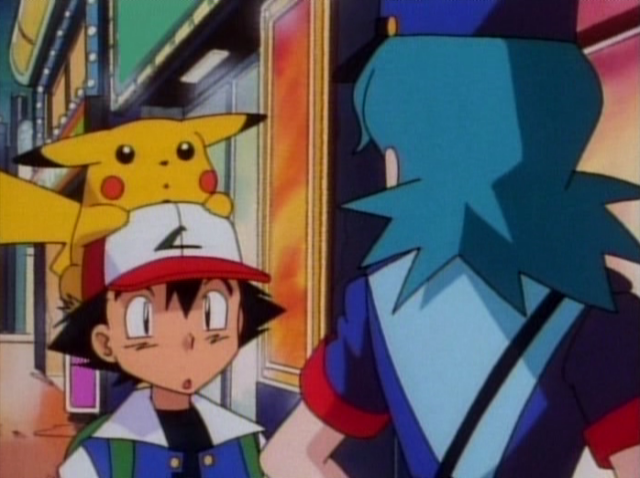 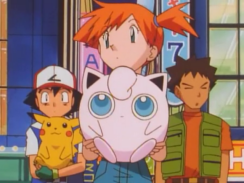 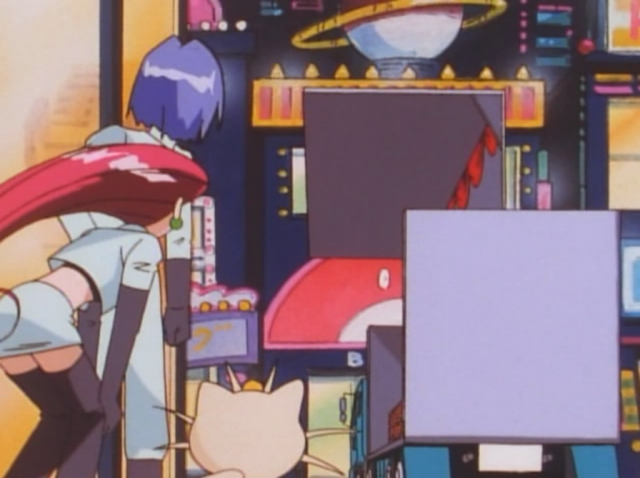 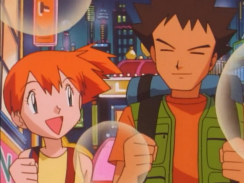 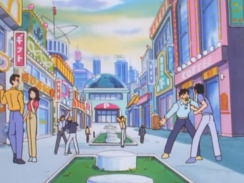 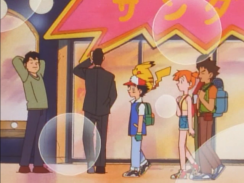 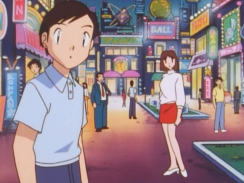 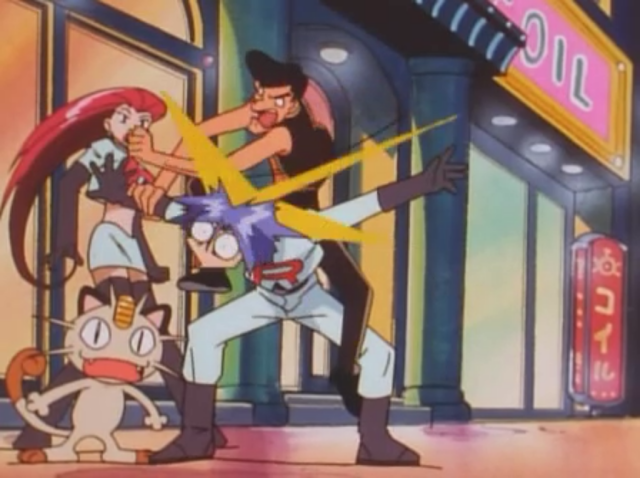 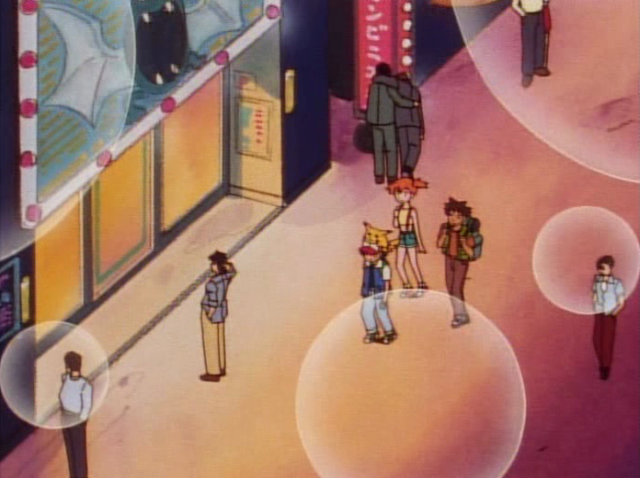 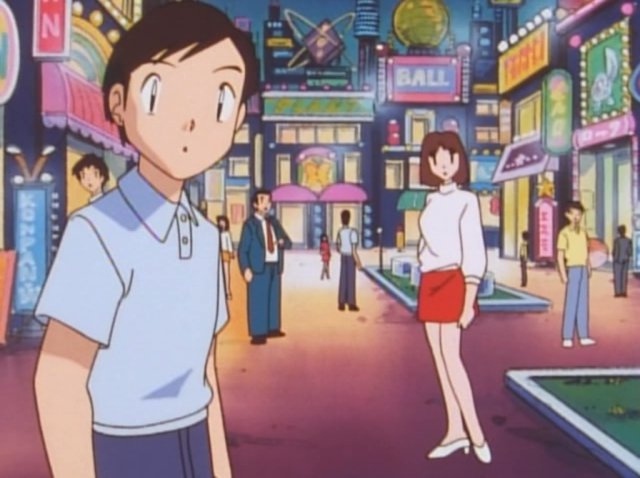 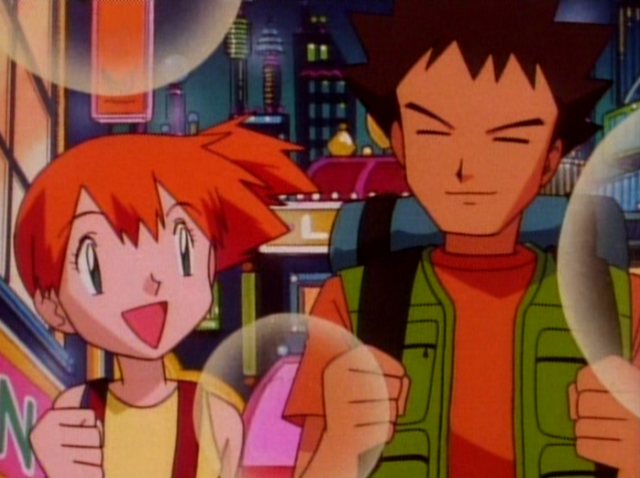 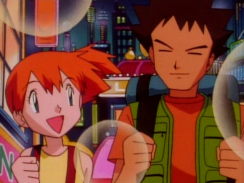 In the episode entitled "The Song of Jigglypuff," 4Kids deletes the Japanese text throughout Neon City. 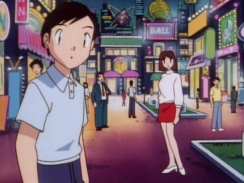 The original Japanese version is on the left, while the edited dub version is on the right. Click on each image to view a larger version. 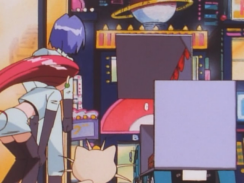 The green sign on the left side of the screen says surotto (スロット), "slots." 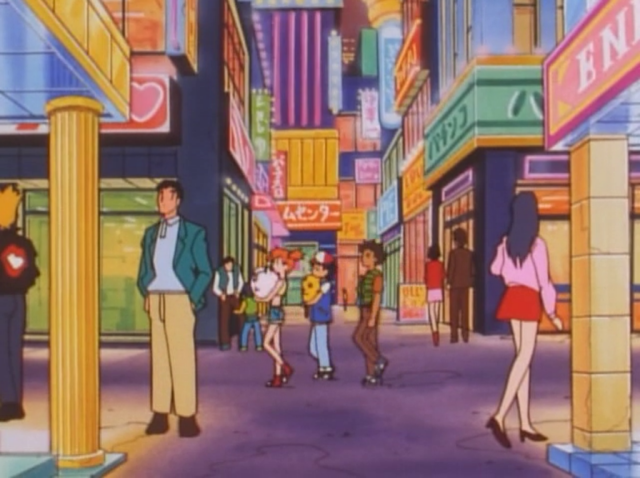 The red sign on the right says sutaa (スター), "star." 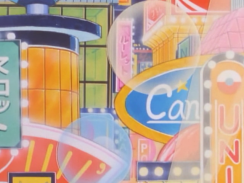 The pink sign says Santa (サンタ), maybe? 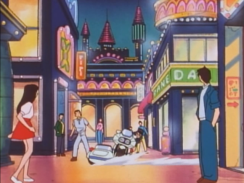 The sign above Kasumi has a stray TO (ト) symbol, which could possibly be the end of the word surotto (スロット), or "slot"
The red sign at the left and the square sign beside the man on the right both get their scribbles erased. The pink sign behind Satoshi says tto (ット), which could possibly be the end of the word surotto (スロット), or "slot." The pink flower-like thing on the green sign at the top gets erased as well. 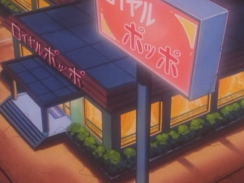 The word surotto (スロット), or "slot," gets erased from the light green sign behind Satoshi. 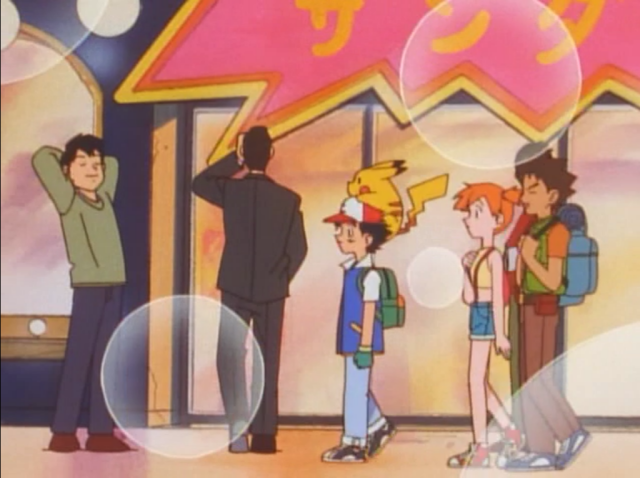 The flowers on the dark green sign behind Pikachu gets erased as well, for some reason. 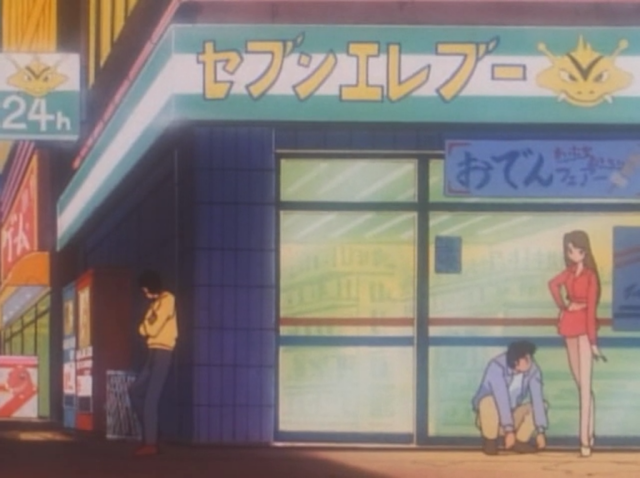 Finally, the word sutoa (ストア), or "store," gets erased from the yellow sign near Takeshi. The text on the red sign near the drunken salarymen that says konbini (コンビニ), or "convenience store," gets erased. Curiously, a similar shot from earlier in the episode was left unedited. Koiru (コイル), or "Coil," gets erased from the red sign behind the punk there. Same Coil sign, different shot. In the Kids' WB! 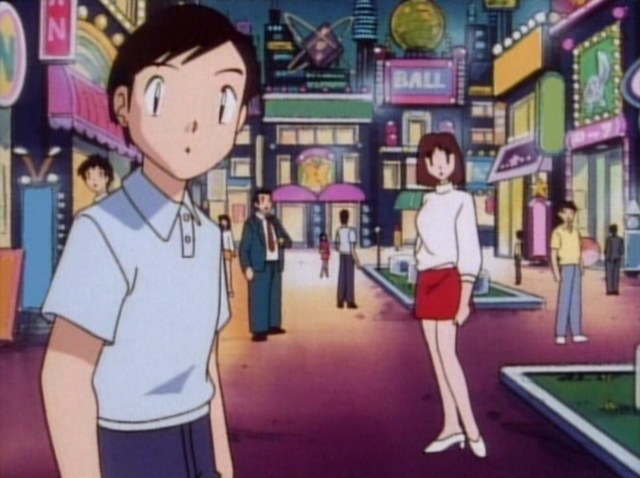 broadcast, this shot ended up getting cut and so this edit version of the shot wouldn't have aired. The word gifuto (ギフト), or "gift," gets erased from the red sign on the left. 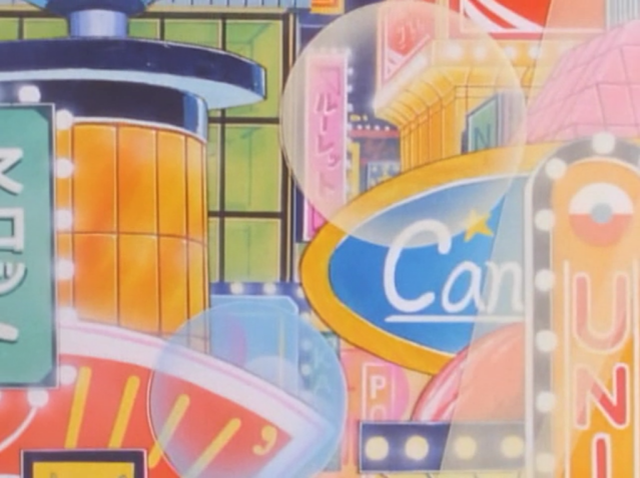 On the upper-right hand corner is a stray katakana N (ン) that gets erased as well. Everything else that gets erased from this shot is just scribbles. 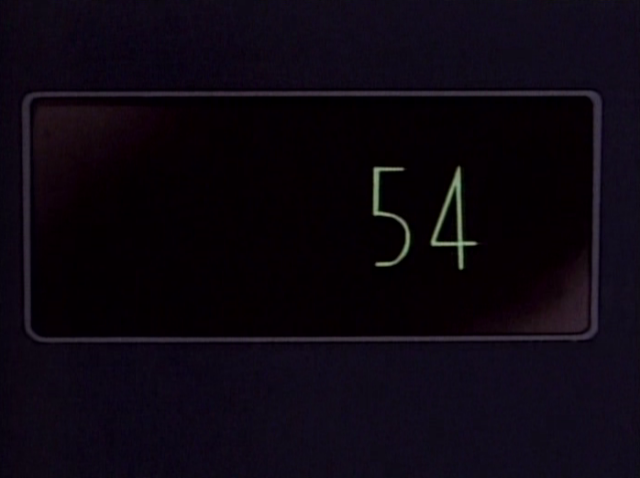 Later, in the forest, the Rocket-Dan's karaoke machine got ten (点), or "points" (as in "54 points") erased. 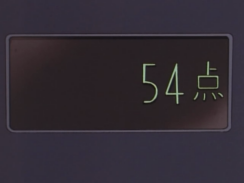 The ten (点) symbol, or "points" (as in the Rocket trio only scored 54 points for their performance) gets erased. Finally, more text gets erased during our heroes' second visit to Neon Town. 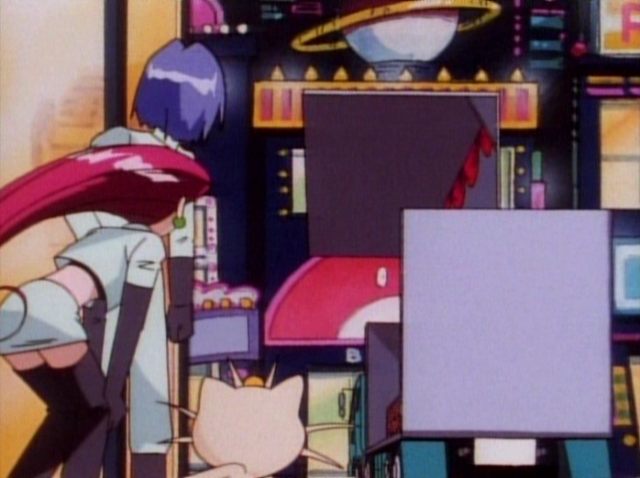 Pachinko (パチンコ), "pachinko," and geemu senntaa (ゲームセンター), or "arcade," are about the only actual words in this shot. 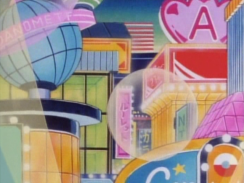 Everything else is just scribbles. I guess 4Kids couldn't tell the difference so they just erased everything that kind of looked Japanese? The text on the blue sign between Satoshi's elbow and Kasumi's hip probably says surotto (スロット), or "slots." There's also a red キ near Kasumi's ponytail at the top. 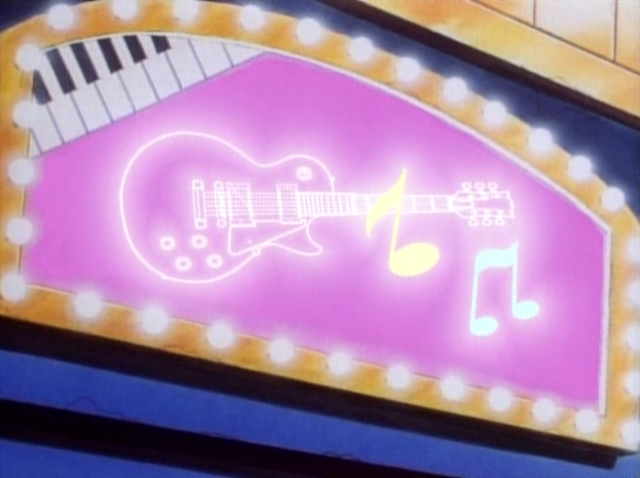 Neon Gakki (ネオン楽器), or "Neon Instruments," gets replaced with a picture of a guitar. 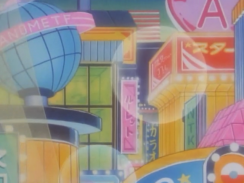 The shop's name, "Neon Instruments," gets erased from both its sign and its front door. 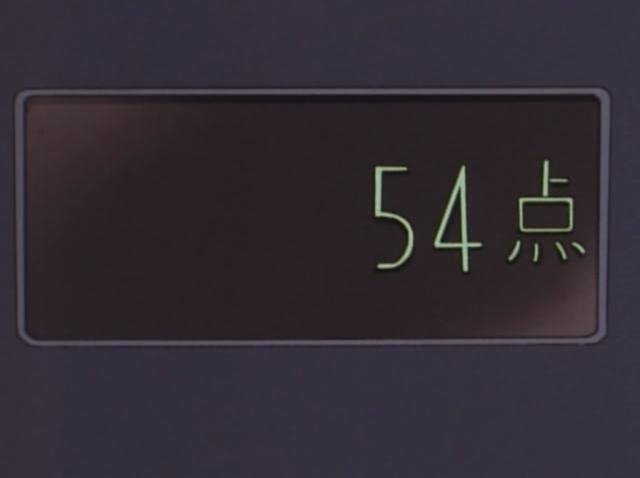 A yellow bu (ブ), probably from the word kurabu (クラブ), or "club," gets erased from the sign near Kojirou's fist. Konpan, written in English letters, gets erased from the blue sign on the left. A garish green sign with yellow letters that says PLANT in English letters, I think, also gets its text erased. Various signs on the right said get their text erased too but the letters are too small and blurry to read. 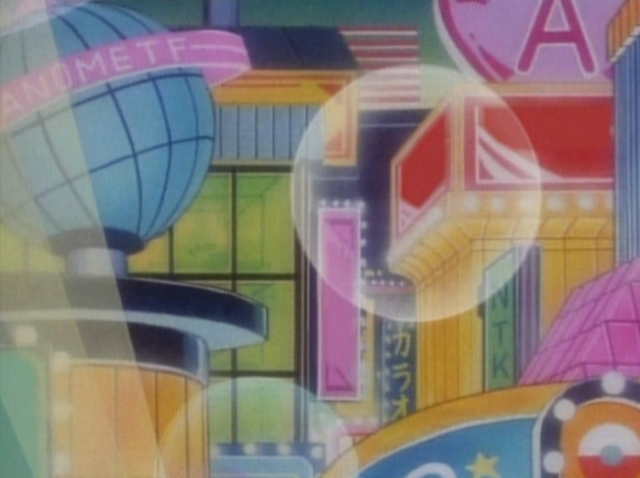 Sebun Erebuu (セブンエレブー), or "Seven Eleboo," a parody of the convenience store chain Seven-Eleven, gets both its text and its picture of an Eleboo erased. The blue sign under it says oden feaa (おでんフェアー), or "oden campaign"; oden is a type of Japanese soup that convenience stores typically carry in the wintertime. A red sign on the very left of the screen that says geemu (ゲーム), or "game," gets its text erased as well. Roiyaru Poppo (ロイヤルポッポ), or "Royal Poppo," a parody of the family restaurant chain "Royal Host," gets its name erased from both the restaurant's sign and its storefront. Similar to the shot at the very beginning of the episode, surotto (スロット), or "slots," gets erased from the green sign on the left. Unlike the previous shot, however, ruuretto (ルーレット), "roulette," gets erased from the pink sign on the right. Sutaa (スター), or "star," gets erased from the red sign. 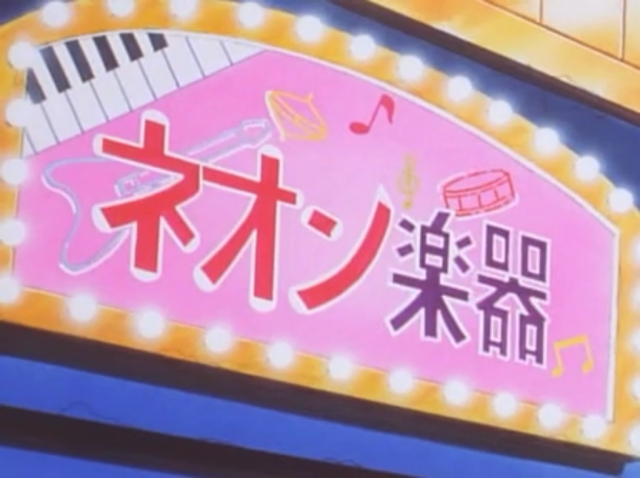 Diguda Kurabu (ディグダクラブ), or "Club Digda," gets its text erased from the sign on the left. 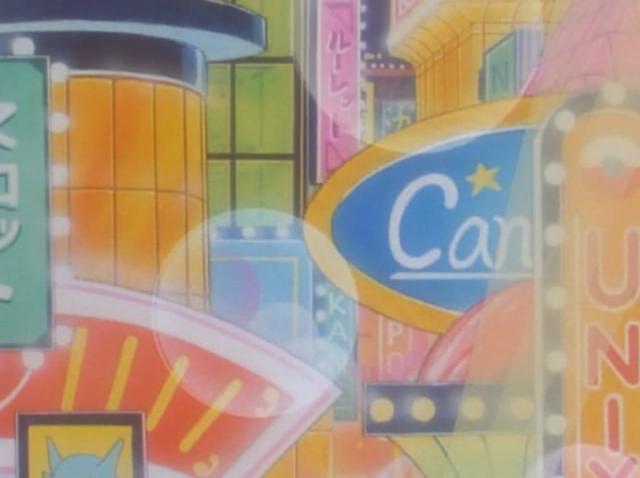 The word chaamii (チャーミー), or "charmy," gets erased from the green sign at the top. The word GAME, written in English letters, gets erased from the green sign below that. Dogasu's Backpack is a fan-created website Pocket Monsters (Pokémon) is © 1995-2017 Nintendo / Creatures Inc. / GAME FREAK, Inc. / Pokémon USA / 4Kids Entertainment Inc. No infringement of copyrights is meant by the creation of the web site.